A perfect way to start your stay in the Straits Area! Or, take this tour just before boarding your ferryboat to Mackinac Island or we’ll meet you at the dock upon your return. Mackinaw City’s story has always been one of transportation – and of being a meeting place for hundreds of years. You’ll see local landmarks where railroads, ships, and automobile travelers gathered. You’ll hear tales of an era long ago when those who walked this land wore moccasins, sold fur pelts, and built the early infrastructure of a village projected to become “the next Chicago.” The population then was 975! It is less today, but Mackinaw City has transformed from a railroad and fishing village in the early 1900s to a bustling, charmed destination point for millions of visitors each year. It’s our history and our future that make the Straits Area so exciting today for our guests. 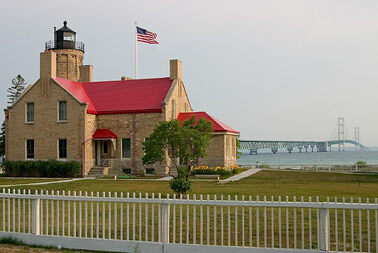 Walk along a beach sidewalk where you can view the Mackinac Bridge, visit Old Mackinac Point Lighthouse*, and hear the stories of those who worked as a marine reporter, a light keeper, or drove a water wagon through the village streets. Why did local residents buy water? You’ll know after this tour, and you’ll see the ingenious way that the business was made possible. The Straits of Mackinac has documented evidence of about 200 shipwrecks beneath its icy waves, and local divers have discovered 48 of them. Your guide has actually visited many of these wrecks, and will tell the stories of these ships’ demise in shrieking winds, foggy calms, and frozen darkness. Hear the mysteries of the wondrous sights of schooners unseen but by a select few since the day they slipped below the waves, and the hidden dangers that still lurk below. Have your picture taken next to a 2,000-pound iron stock anchor once used by a sailing schooner of the 1800’s, since recovered by divers from the Straits. 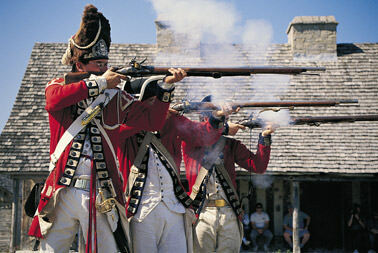 Visit Colonial Michilimackinac*, hear local lore of a lifestyle that even today is very different from most other hometowns, and experience a view of marine history before your very eyes in the variety of ships that travel these waters. 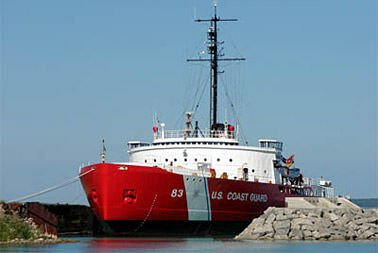 See the Icebreaker Mackinaw Maritime Museum*, newly berthed here. 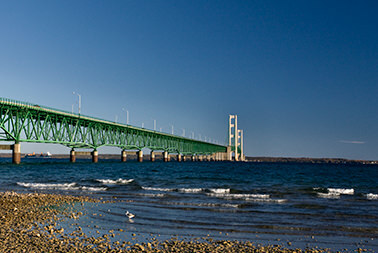 What is there to see in Mackinaw City? Many tour operators who have been coming here for 20 years tell us they never knew there was so much until they took our Mackinaw City tour!